The Backyard Workshop is dedicated to finding you the best products available to meet your particular needs. You help support us through our carefully chosen links which earn us a commission. Read more about our standards. When it comes to pure power, there is still nothing that can really compare to a gas powered weed eater. Most lawn care professionals prefer gas powered for their jobs due to the sheer power and performance that you get in a convenient package. The downside to gas power is needing to mess with gas and oils to keep them running. This also means they aren’t as user friendly as a battery, or electric weed eaters. However, gas powered weed eaters have evolved a long way over the past decade when it comes to low emissions. They don’t leave as big a carbon foot print as they used to back around the turn of the century. While you can find more in-depth information in the buying guide, the first decision you need to make is how your trimmer will be powered. For many people, gasoline is a good choice. Since this is a relatively-large tool purchase, it’s a good idea to make sure you are aware of the positives and negatives of a gasoline-powered weed eater. This table below quickly lays out the pluses and minuses. Gas powered weed wackers are known for their power, and ability to cut through thicker weeds and growth. There’s a reason most professionals use gasoline. In addition, the lack of cords or limited battery power mean you can cover a larger area more efficiently with a gas-powered model. You generally won’t have to stop as often to refuel with a gas powered weed eater when compared to changing batteries with a battery-powered weed whacker. On the downside, gas powered trimmers are louder than electric models. They emit toxic fumes from their combustion engines. Keep in mind 4-cycle engines aren’t as loud or smelly as 2-cycle models. Gas-powered wackers in general are heavier than either of the electric-powered types. They also require maintenance – both during the cutting season by mixing oil and gas at each refueling (2 cycle) and to get ready to put the tool into storage. Neither electric-powered model types have that requirement. We update these recommendation regularly – as new models come out, an older “top pick” isn’t always the best choice anymore. Please check back regularly to see what changes might have occurred. This Husqvarna is a solid choice for all-around gas weed-eating needs. It ticks off most of the boxes in the feature category. To begin, the 2-cycle engine provides plenty of power to tackle the most common weeds found in your yard. Engine-starting isn’t hard – just remember to prime the engine by “pumping” the button a few times if you haven’t used it in awhile. (Hint: non-ethanol gas helps too). This model can take on many common attachments. Generally, attachments by different manufacturers are made to “universal fit” – though it is a guarantee all manufacturers follow this guideline. Poulan Pro ones will definitely fit – since Husqvarna makes Poulan Pro products. This means you’ll likely be able to use the attachments you already have lying around with this trimmer. Otherwise you can buy new Husqvarna attachments to turn this tool into a pole say, edger, and other devices. Finally, the bump head is convenient – just tap the head on the ground (not too hard!) to move more line forward. The relative merits of 2 versus 4 cycle engines can be a bit of a religious debate. I’m not going to weigh into that right now – they each can be the right fit for the right person. I personally hate mixing oil – yet don’t have a problem filling up an oil reservoir. I also like breathing in 2-cycle fumes even less than 4-cycle, so I tend to like 4-cycle products. Others don’t like that there are more parts to break and they are heavier at a given power vs. 2 cycle engines. If you are like me and want a 4-cycle, the Troy-Bilt is one to look at. This weed eater is available in both straight and curved shaft models. If you hate to pull the cord to start the engine, there is an engine starter available that will remove that chore from your life. It cuts a wide 17in path through high grass and weeds which is at the upper end of the trimmer spectrum. You’ll be able to do more in less time because of this wide cut area. The starter and 2-cycle engine on this strings trimmer is designed to start quickly without a lot of pulling work from you. Husqvarna calls this the Smart Start function. The trimmer also include an auto return stop switch. When the machine is turned off, the stop switch automatically returns to the start position for easier starting – so you don’t accidentally pull and pull in vain because you forget to reset the switch. At just under 11 pounds without fuel, this weed whacker is light enough for most people to use it comfortably. It’s not as light as a corded electric trimmer, but it’s still lightweight enough that you’ll be ok using it around your yard for the afternoon. If you want to replace the trimmer head with a grass blade, this model is for you. As we said before, you need to look at your individual yard needs before you rush out and buy a weed trimmer. IT doesn’t have to be an hour-long process, but there are some decisions you need to make so you can be sure you’ll be happy with your purchase. Let’s go through the questions you need to ask yourself in order to pick out the right power tool for your situation. In addition, you need to decide for yourself just how much you want to spend – how many hours a year will you be using this tool? For some people, a little inconvenient with a cheaper model is worth it. For others who might spend 8 or more hours of their free time using the weed wacker, saving some time with a more powerful model is worth the extra cost. Like most things in life, there are trade offs between money and time-spent. If you live in an area where the gasoline is reformulated with ethanol, please be careful not to leave the gas in the tool for weeks at a time. It can damage the engine – particularly some of the tubes/hoses. Some have had success using a stabilizer (FOAM is a brand name used a marine engines that seems to work). Ideally, you’ll be able to find gasoline for marine engines that doesn’t have ethanol in it. Oil is important as well. I once read an article in Loggers World magazine (yes, there is such a thing). In it, an “engine insider” whose job it was to keep track of why small engines were returned to the manufacturer discussed the importance of using the right oil:gas mix and manufacturer brand for 2-cycle engine oil. The manufacturer-recommended oil is made for the engine type. Other, cheaper brand oil might not be. It’s nto worth the hassle of having to buy a new engine just to save a few dollars in my opinion. The size of your yard and the kind of foliage that needs whacking influences the cutting diameter of the string trimmer. A 10-14 inch cutting diameter is the best choice for a small yard. In larger gardens with thick weeds and dense foliage, the 15-18 inch cutting diameters work better. The bump-string feed is the most common feed system. You tap the cutting head of the string trimmer on the ground for the string to feed out. The fixed or manual string feed requires you to switch the weed whacker off when you notice your string is too short. You then must to manually unwind or pull the string out. With the automatic string feed, the string feeds out automatically when it becomes too short. Usually you just start and stop the weed eater a few times to let out some line from the head. The trimmer line is made of polymer or nylon string. The standard-grade line is economical and used in small yards for low-intensity weed whacking. The commercial-grade line is used for thick and tough weeds. Weed eaters usually (but not always, check the product description) can only handle one string size. •	0.065-0.080 inches for light weed whacking in residential lawns. •	0.085-0.100 inches for bigger gardens and tougher weeds. •	0.110+ inches for open fields, large commercial and industrial landscaped gardens, and the toughest weeds and foliage. The bigger the diameter of the string, the heavier the spools become. The curved shaft works best where a lot of maneuverability is necessary. The shorter shaft string trimmer maneuvers easier around flower beds, narrow lawns, and tiny yards. It’s usually a better choice for beginners. A straight shaft has a longer reach and works ideally in large gardens. These weed eaters are a more heavy duty for weed whacking than the lighter curved shaft. Straight shaft weed eaters are often used on commercial properties. Before you purchase a weed eater, test for a balanced handle. Lift the weed eater and feel the balance of the weed whacker. If you are buying it online, look at the reviews or open the box right away so you can return it if it doesn’t feel right. After you’ve adjusted the handle so that you don’t reach too forward lift it again. Hold the weed whacker as if you’re trimming your lawn. Does it feel balanced? The weight may be heavier at the top, but the trimmer should be overall balanced when holding onto the handle with both hands. Notice the position of the controls. Is it easy to reach and comfortable to operate? Weed eaters with the motors mounted at the top close to the handle generally feel better balanced than the ones with the motor at the bottom. String trimmers are noisy. Electric trimmers are quieter than gas ones with volume sometimes coming under 75 decibels. Wear ear protection to safeguard your ears while trimming your yard. It’s recommended that bystanders should protect their ears too. Gas weed whackers are the noisiest trimmers; the 4-cycle engine is generally quieter than the 2-cycle of the same size. The spiral shaped string reduces the noise level and is often used in commercial areas with noise restrictions. 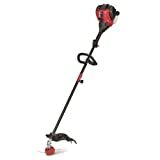 What features are most important to you when looking for a string trimmer? If we’ve missed an important feature, why don’t you share it with the readers by leaving a comment? Gas weed wackers are great for boys and first timers, they have a lot of really nice aids and advantages over electric weed whackers that make weed wacking a lot easier, especially if you have a hard time getting and keeping your intensity up. Having the engine right there with you makes it easier to deal with when something goes wrong. It also means the weed wacker is a lot louder and sounds meaner and more dramatic to weeds than an electric weed wacker. The strings are designed to moan at the weeds as they spin to help make weeds tear up earlier, and they keep moaning during their weed wacking, so weeds are more likely to keep crying and not fight back. The better models also have a separate part that will cry with the weeds sympathetically, making sure even the meanest, most stubborn weeds sound just as sorry as the rest. The string is usually a lot thicker then electric models, so it hurts a lot more at lower speeds. They also have little teeth cut in that drag on weeds as they whip them, helping to weaken them and burn weeds like a higher pitch electric model would do. Gas weed wackers are also better at weed wacking groups of weeds, since the string can whip all of them without slowing down, and the engine is loud enough so it can be heard over all the weeds crying together. The best part of gas weed wackers is the trigger. This put a you in direct control over how hard the weed wacker is crying and therefore how intense the weed whacking is. It also make is easier to control the weed wacker when the engine starts to fuss. That said they are harder to maintain. You have to manually start them with a string, and spend a lot of your attention on them while you weed wack. They’re heavier and louder than electric weed wackers. Unlike electric weed wackers if the engine is being stubborn or is having a hard time you have to be there for it and keep it under control. This is a especially annoying for girls, since our hormones are usually raging away when we’re focused on punishing our weeds and it’s hard to keep them in check and keep the engine from hurting itself. If every time you pull the trigger your weed wacker throws a temper tantrum, it’s probably time to go electric. Electric models are also just more effective. The weed wacking is a lot more painful and intense for weeds with electric weed wackers since the string hits them so much faster, and it’s also more prolonged since it takes longer for weeds to die with the thinner string. It’s more personal too since you have to focus on one weed at a time. Once you get really good at weed whacking you don’t need all the help a gas weed wacker provides, and that plus the fact that you don’t have to worry about the engine all the time means you have way more control over and can focus on the whole point of weed wacking anyway: weeds. I am thankful that they listed the pro and cons of the gas powered equipment. The graphics are helpful and informative. I like to be well informed on the products that I am choosing to buy. This was very informational website. I appreciate the description given here. This was a very well organized article. The differences in each machine were well explained. In the past I have used gas powered weed eaters, and of course they do a great job! I do trust all the concepts you’ve presented to your post. They’re very convincing and will definitely work. Nonetheless, the posts are too quick for starters. Could you lease lengthen them a little from next time? Thanks for the post! The disadvantages outnumber the advantages! Noise and fumes are my pet peeves so this line is a definite no for my family. Anyway, I enjoyed reading this comprehensive guide. I learned some new things. Hello, I just stumbled upon your site. This article is very detailed and easy to read. However, I don’t understand one term in the illustration. What exactly is “touch grass”? Thanks. “However, gas powered weed eaters have a long way when it comes to low emissions and don’t leave as big a carbon foot print as they used to.” I feel that gas powered weed eater just like the emission test for the old vehicle. I thought, if it has emission test report, then, customers have some more confidence on that. As I need a gas trimmer because of the size of my property, I am concerned about the overall weight. I am a 74 yr old woman and this is important, but I many times don’t find the weight in the information. Even though girls are allowed to use both gas and electric it’s hard for us to control gas. The gas weed wackers can tire you out pretty quickly, and the more comfort you give the worse it seems to get. The problem is it makes it feel worse. Try holding the engine close to your chest (make sure you have a good bra) instead of in your stuff so it doesn’t hurt as much and it will be in a more natural position for comforting. Take frequent breaks and cool down every so often too.